The rising demand for land with the purposes other than agricultural activity including the development of Special Economic Zones (SEZs), infrastructure development and urbanization, etc. are restructuring the rural transformation and its political economy. To fulfill these demands, land is being acquired from the farmers/individuals which have put the agrarian question (vis-à-vis land question) at the forefront in country’s political spectrum and as well as in the academia. The process, under which land is acquired for these various purposes, historically, goes with the Colonial Land Acquisition Act of 1894. Though, the Act went through several amendments at different times, but its original nature remained intact (Verma, 2015). The original nature is sensed in such a way that the successive Central and State governments under the clause “eminent domain” acquired land and transferred them to fulfill demands from the public sector as well as the demands from private land seeking capitalist agent/agency/firm etc. Although, land acquisitions for both public and private purposes took place in the pre-economic reform period to set up heavy industries, development of infrastructure, urbanisation and Export Processing Zones (EPZs), etc., but since the adoption of market led development strategies (liberalization), the acquisition of land has marked a significant increase. Apart from above mentioned motives, land is also being acquired to develop liberalized[i] peripheries called SEZs (Levien, 2011; Verma, 2015). Unlike earlier, the current sway of land acquisition is witnessing huge public opposition and is inviting conflicts, protests and movements by the affected farmers/peasants. These trends, many have seen as, the privatization of development through which beneficial investment opportunities were provided to the capitalist classes and have the enigma of privatize profits and socialize losses (Foster and Magdoff, 2008). The land for the SEZs is acquired by the Government based on the ‘market rates’ (which in itself is a confusing term) from the farmers/individuals. The infrastructural facilities for the development of SEZs are also provided by the Government, and later on, the acquired land is transferred to SEZ developers (private local/foreign investors) to develop SEZs. But under the SEZs law, only 35 percent (now increased to 50 percent) of the total acquired land would be used for productive purposes. For the remaining half, the developers are free to use for other purposes like selling it to different private investors for commercial uses (building high rising residential colonies, constructing golf courses, shopping complexes, schools and hospitals supported by corporate conglomerates) which are pouring them windfall gains (Levien, 2011). But, on the other side, through the processes of land acquisition, the farmers lost their agricultural land and also lost agriculture as principal occupation, compensated at some length, forced to migrate for an alternative means of livelihood adding up to the already existing “reserve army of labour”. Such economic transformations, as Hobsbawm (1957) and Patnaik (2011) argue, are nearer to the Western Europe’s industrial revolution when pre-capitalist producers were dispossessed and had been forced to seek employment in the factories. The Western European model of industrialization, many have argued that, it has exported the path of European agricultural/rural transformation (agricultural question of North) to the Global South and has also consequences of relation with the monopoly capital, militarism, loss of environmental diversity and social and political upheaval (Harvey, 2005; Moyo et.al. 2013). Thus opting for such similar development trajectory of European style and roll back of the State in India from directly protecting and promoting the petty producers (not only the peasantry but craftsman, herdsmen, fishermen, handloom weavers and other such producers) has provided enough space to private/corporate capital (both domestic and international) to encroach and subjugate upon the petty producers (Patnaik, 2016; pp. 47-48). In this backdrop, the paper would try to understand trends, trajectories and their impact on farming communities due to land acquisition especially for SEZs. Government of India enacted SEZ Policy in 2000 and since then there have been a significant spurt in approvals and notification of SEZs. Initially, there have been only seven EPZs[ii] controlled by the Central Government itself which later on were converted to SEZs. There were 11 more SEZs[iii] established by the State Governments/private sector during the period 2000 to 2005. The EPZ established by the private sector in Surat (Gujarat) was converted to SEZ after the SEZs Act came in 2005. Since then, the Government has formally approved 420 SEZs out of which 351 have been notified, but only 218 SEZs (51.9 percent of the total approved) are operational (see Table 1). Around 89 percent SEZs approved are situated only in 10 states (Karnataka, Maharashtra, Telangana, Tamil Nadu, Gujarat, Andhra Pradesh, Kerala, Haryana, Uttar Pradesh, and Madhya Pradesh). This pattern of SEZs development also clarifies that the most of the units are concentrated in the states which have relatively better infrastructural and industrial development and relatively underdeveloped states are left out. Source: Ministry of Commerce and Industry (MoC&I); * & ** are author’s calculation. The largest segment of SEZs is under the IT/ITES/Electronic Hardware/Semiconductor/Services where 274 SEZs are formally approved, 230 are notified (83.9 percent of the formally approved), but only 126 of these approved (46 percent) are operational (see Table 2). The second and third largest in number are SEZs under Biotechnology (22 approved, but only 3 are operational) and multi-product (20 approved and all are operational). Under the agro-sector only 5 SEZs are approved and out of these only 1 is operational. The sectoral divisions of SEZs attribute the fact that almost every second unit of SEZs is established to provide outsourcing services rather engaging themselves in physical production activities. Source: author’s computation, Ministry of Commerce and Industry (MoC&I). The data on year-wise notification of SEZs show that almost 81 percent these notified SEZs and 88 percent of the total land acquired for them was during the period 2006-09. So, these SEZs have got ample of time to start (gestation period) their operations for the purposes they were set up i.e. providing production of goods and services, generation of employment and export promotion. But, looking at their performance in creation of jobs and land use, it seems, the story is entirely different what it was expected (CAG, 2014). Looking at the Table 3, there is an indication that after 2009, both, the notification of SEZs and acquisition of land for them have witnessed a drastic decline? The probable answers could be, first, failure of the government and the SEZs developers to utilize the acquired land and subsequently, second, the eventual unrest and distrust in the form of protests and movements raked up among the affected communities mostly by the peasants and agricultural labourers due to unfulfilled promises, incomplete and half-unfinished compensations. Few of these protests and movements against the land acquisition that took place in the period 2005-10 include Singur and Nandigram dispute (Hooghly and East Medinipur district, West Bengal), The Relaince Maha Mumbai Special Economic Zone Project Dispute (Raigad district, Maharashtra), Goa Industrial Development Corporation Dispute (Goa), POSCO Dispute (Jagatsingpur, Orissa), Kalingnagar Land Dispute (Jajpur, Orissa), Mangalore Special Economic Zone Dispute (Karnataka), Dadari Land Dispute (Gautam Buddh Nagar, Uttar Pradesh), Kakinada SEZ Dispute (East Godavari District, Andhra Pradesh), Brandix SEZ Dispute (Vishakhapatnam, Andhra Pradesh) and DLF Land Dispute (Amritsar, Punjab). These protests forced the governments (both at the Centre and States) to slowdown the process of notification of SEZs and acquisition of land. 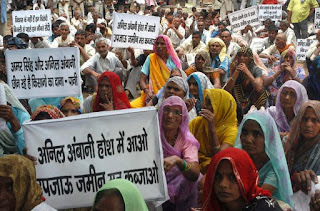 The public outrage led UPA II government to enact to the ‘Right to Fair Compensation and Transparency in Land Acquisition Rehabilitation and Resettlement (LARR) Act, 2013’ which included clauses like social assessment and community nod for land acquisition, development of forest land and also developed a criterion of compensation to the affected communities (Verma, 2015). Of the total acquired land (48.99 thousand hectares) in the country, around 19.63 thousand hectares (39.27 percent) are in use according to the information provided in the Rajya Sabha on March 18th, 2015 by the Minister of State in the Ministry of Commerce and Industry and the remaining land is lying vacant. Some studies figure out that the actual land acquired being shown by the Government sources is lesser than the extent of land that has been acquired by the developers for the SEZs (Levien, 2011, CAG, 2014). The utilization of land for these SEZs varied from zero percent in Delhi, Goa, Manipur, Jharkhand, Nagaland and Puducherry to 88.0 percent in Telangana, followed by 66.57 percent in West Bengal. The states which have higher number of SEZs (Karnataka (32.1 percent), Maharashtra (25.9 percent), Tamil Nadu (42.2 percent), Gujarat (44.8 percent), Andhra Pradesh (40.2 percent), Kerala (37.7 percent), Haryana (8.4 percent) and Uttar Pradesh (29.1 percent)) perform lowly in terms of utilizing the acquired land (see Table 4). The acquired land is not being used fully due to the reason that there may have been ‘misplaced expectations and wrong decisions of investments’ by the developers who got several concessions to develop SEZs, but could not attract the commercial clients (Chandrasekhar, 2015). The land acquired under the public domain is transferred to SEZ developers or other private stake holders. Here, again a mechanism develops through sale and resale of land that converts it to a highly profitable form of commodity. If land is being used as a commodity through multilayer sales, there also emerges a rentier capitalist class (SEZ developers appointed by the government) or real estate developers (Levien, 2011). These rentiers earn absolute ground rent[iv] or imperialist rent through control on acquired land which earlier belonged to the farmers (Patnaik, 2007; Amin, 2011). On the contrary, the peasants and individuals whose land is acquired get only compensation though in official language, it is termed as market price. The official market price is underestimated and is normally based on previously listed sales prices over several years which at most of the occasions are below the actual purchase prices to avoid several taxes imposed by the government at the time of sale. Thus, these artificially underestimated prices in the form of compensation are far from real prices which in any sense must be according to the proposed use value of land (Levien, 2011). Even after a decade of SEZs Act passed by the Parliament, only half of the total notified SEZs are in operation. The SEZs were established with the primary objective of “export oriented manufacturing’, but every second unit among the SEZs is operating as service producing unit. Of the total acquired land for the SEZs, around 60 percent is lying unutilized all over India. Also, the states which have higher number of SEZs perform lowly in terms of utilizing the acquired land. Not only this, but for various other purposes, like, urbanization, residential colonies, setting up of other manufacturing units and highways etc. ; we have no exact information how much land is acquired, how it is being utilized and how the affected communities are compensated. The Government is acquiring land as ‘eminent domain’, but all these are being transferred to private developers who have changed themselves into rent seeking agents through multilayer sales of land to earn absolute ground rent. These methods of land acquisition and its rent seeking purpose through commoditizing land have spread unrest among the affected communities in many corners of India inviting various movements against land acquisition. [i] The SEZ Act furnishes a broad cover of legal framework to establish such units which could assure all the stakeholders in an SEZ, namely, developers, operators, occupant enterprises and domestic suppliers. SEZs are also supposed to create townships with the creation of productive units for which a green-field multi product SEZ, that can acquire a maximum of 5000 hectares and the State Governments would set up the minimum required area limit. To provide simplified procedures for SEZs, single window system of operation has been adopted for clearance, setting up of units, to tackle the matters related to Central and State Governments and for documentation and self-certification. Under the provision of SEZ Act, several tax incentives and other facilities were provided to SEZ developers. These incentives include 100 percent income tax exemption for entrepreneurs for first five years on incomes occurred through exports, 50 percent exemption for next five years and 50 percent exemption on ploughed back export profit for next five years under section 10AA. Other important direct tax incentives are income tax exemption for Developers under the section 80-IAB of the Income Tax Act on income occurred from SEZ development in a block of 10 years in 15 years; exemption from Minimum Alternate Tax (MAT) and Dividend Distribution Tax (DDT). Among the indirect tax benefits to SEZs include duty free imports and domestic procurement of goods; exemption from Service Tax and Central Sales Tax. SEZs are entitled for external commercial borrowings upto $ 500 million in a year; exemption from state VAT, stamp duty and other levies (CAG, 2014). [ii]The Seven Export Processing Zones (EPZs) established by the Central Government were in Kandla (Gujarat), Santa Cruz (Maharashtra), Cochin (Kerala), Noida (U.P. ), Chennai (Tamil Nadu), Falta (West Bengal) and Visakhapatnam (Andhra Pradesh). [iii]The SEZs established by the State Governments/private sector during 2000 to 2005 were West Bengal (2), Gujarat (1), Madhya Pradesh (1), Uttar Pradesh (1), Rajasthan (2) and Tamil Nadu (4). [iv]Adam Smith, Richard Jones and later on Karl Marx described that the absolute ground rent exists due to land monopoly exercised by private land ownership under capitalism. Amin, Samir (1976): Unequal development, New York, NY. Monthly Review Press. Chandrasekhar, C.P. (2015): A Lesson on Land Acquisition, Published in The Hindu, April 4, available at http.//www.thehindu.com/opinion/columns/Chandrasekhar/cp-chandrasekhar-column-on-sezs/article7067787.ece, accessed on August 4, 2016. Comptroller and Auditor General of India (CAG) (2014): Performance of Special Economic Zones (SEZs) Report No. 21, Department of Revenue, Government of India. Foster, John Bellamy and Fred Magdoff (2008): Financial Implosion and Stagnation, Monthly Review, Volume 60, Issue 07, December. Harvey, David (2005): A Brief History of Neoliberalism, Oxford University Press. Hobsbawm, E.J. (1957): The British Standard of Living, the Economic History Review, New Series, Vol. 10, No. 1, pp. 46-68. Levien, Michael (2011): The Land Question. Special Economic Zones and the Political Economy of Dispossession in India, Paper presented at the International Conference on Global Land Grabbing organised by the Land Deals Politics Initiativ (LDPI) in collaboration with the Journal of Peasant Studies and hosted by the Future Agricultures Consortium at the Institute of Development Studies, University of Sussex, 6-8 April, 2011. Moyo, Sam; Praveen Jha and Paris Yeros (2013): The Classical Agrarian Question. Myth, Reality and Relevance Today, Agrarian South. Journal of Political Economy, 2 (1). Pages 93-119. Patnaik, Prabhat (2016): Economic Liberalisation and the Working Poor, Economic and Political Weekly, Vol LI, No. 29, July 16. Patnaik, Utsa (2007): Agrarian Question in Marx and His Successors. Volume I, Leftword Books, New Delhi. Patnaik, Utsa (2011): The ‘agricultural revolution’ in England. Its cost for the English working class and the colonies, In Shireen Moosvi (Ed), Capitalism, colonialism and globalization. New Delhi. Aligarh Historian’s Society & Tulika Books. Verma, Santosh (2015): Subverting the Land Acquisition Act, 2013, Economic and Political Weekly, Vol. l, No. 37, September 12.